Okay, how marvellous is that. Only three concert dates have been revealed so far - they're playing the Northside Festival in Aarhus, Denmark; the Latitude Festival in Suffolk, UK and the Øyafestivalen in Oslo, Norway - but there's more dates to be announced. I'm so hyped up already: I've seen both artists perform the anthemic "The Girl And The Robot" live but now there is a possibility to actually see them share the stage during the song? Also, it's been quite a while since we've heard anything of Robyn so it's great to get her back. 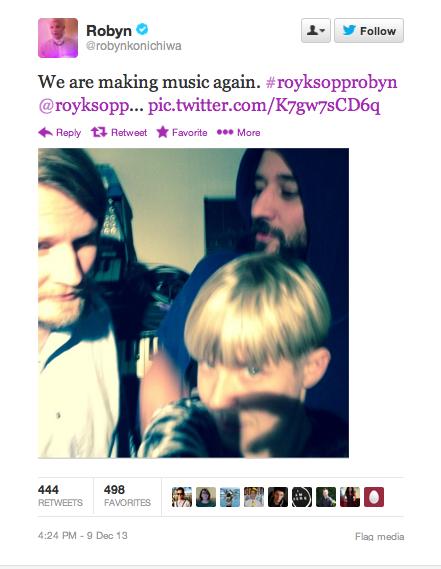 And it seems that Robyn + Röyksopp is a match made in heaven - just listen to their previous collaborations "The Girl And The Robot" and "None Of Dem". They're cordially invited to blow my mind with new stuff anytime. And this is how incredible the three sound live. Brace yourselves!